Not quite “World Famous” but my family loves this very simple and easy to make Black Bean And Corn Salsa. I’m pretty sure my Mom told me how to make it but since she didn’t write it down I’m taking credit for it! This Black Bean And Corn Salsa recipe is great as a side dish with some grilled chicken or as an appetizer at parties. I’ve made this on several occasions and I always bring home an empty bowl! Much to the disappointment of my family. haha! This recipe can even be made ahead of time. I brought it to a church function with me recently but didn’t have time to put it together before leaving for church so I made it the night before and just grabbed it on the way out the door the next morning. If you’re looking for an easy, tasty summer side dish or if you just need something quick for a party then I highly recommend this Black Bean And Corn Salsa! For some added flavor be sure to add the homemade dressing to your salsa! Rinse and drain the can of black beans. Now take your corn and pour it (juice and all) over the black beans. DON’T try to shake all the juices off. Just let gravity work. Put the corn and bean mix in a medium bowl. Should be a little juice. Next thing to do is dice up the onion and add it to the bowl. Now dice up your tomato over the bowl so any juice will drip into the bowl. Finely dice your jalapeno and add it to the mixture. Take your cilantro bundle and cut off the stems close to the leaves. Finely chop the cilantro then add this to the bowl. Add juice of a lime and if desired, mix up the Homemade Dressing Recipe below. 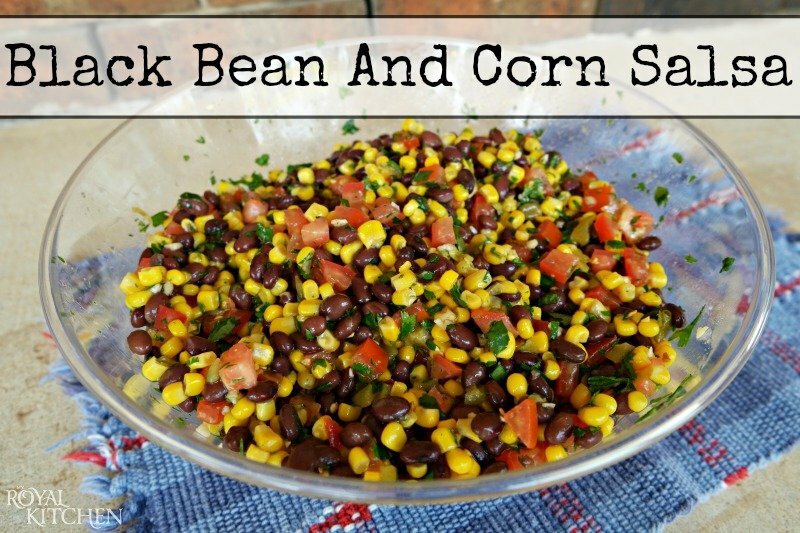 Mix together well then pour over the corn and black bean salsa and mix it all together. Not quite “World Famous” but my family loves this very simple and easy to make Black Bean And Corn Salsa. Now take your corn and pour it (juice and all) over the black beans. DON'T try to shake all the juices off. Just let gravity work. This salsa looks delicious! I was just looking for the black beans recipe and will try this one.